Paper alleges Palestinian Authority support for two-states, Trump's vow, and more; CAMERA cites several examples. 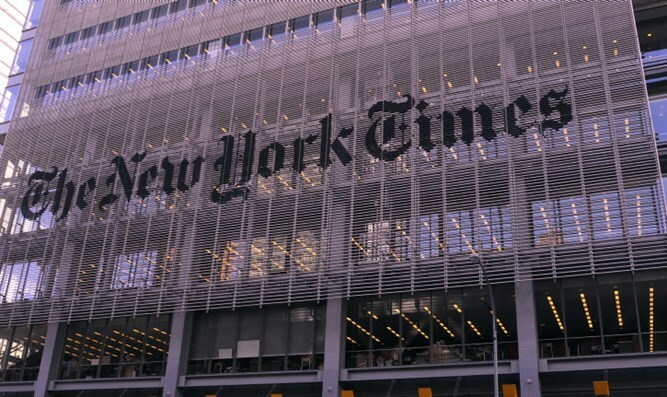 While the New York Times boasts of its "fact-based journalism," the CAMERA media watchdog organization reports on several examples of misinformation the newspaper has reported in recent weeks regarding Israel and the PA – yet refuses to correct. 1. The Times wrote, on Dec. 29, that "most governments and world bodies have set achievement of the two-state solution as official policy, including the United States, the United Nations, the Palestinian Authority, and Israel." However, in fact, many PA leaders refuse to accept this solution. Nabil Shaath, for instance, said, "The story of ‘two states for two peoples' means that there will be a Jewish people over there and a Palestinian people here. We will never accept this." Mahmoud Abbas has made similar statements. CAMERA – The Committee for Accuracy in Middle East Reporting – states, "New York Times editors have refused to set readers straight with a correction — despite repeated requests from CAMERA that they do so." 2. On January 16, the Times reported that Donald Trump has "vowed to support Israel no matter what." When asked to provide a source for this claim, the newspaper told CAMERA it had no specific vow in mind, but rather was referring to Trump's "collective positions." The newspaper has refused to correct the misinformation, CAMERA reports. 3. The Times calls Judea and Samaria "Palestinian territory," instead of referring to it as "disputed territory," as it does in many other cases around the world. Formal agreements between Israel and the PA state that the status of Judea and Samaria is still to be determined in negotiations between the parties, yet the Times insists that it is justified in calling them "Palestinian." 4. Finally, The Times' report on the recent Paris conference resolution is wrong on two accounts. It stated that the participating countries issued a joint communiqué calling for "a return to the 1967 boundaries between the Israelis and Palestinians, including the removal of Israeli settlements from the West Bank." In fact, however, the communiqué says not a word about a removal of settlements, but rather calls on the parties to "reverse the current negative trends on the ground, including continued acts of violence and ongoing settlement activity." Similarly, the resolution does not mention "boundaries" at all. It calls for a solution that should "fully end the occupation that began in 1967," but diplomatic declarations of this sort generally come with statements that there will actually be changes to the former dividing line. Even ex-Secretary of State John Kerry recently called for both a full end to the occupation and a withdrawal to something other than the 1967 boundaries.